It’s hard to believe, but Chicago Comic Con is this weekend! This will be the first time I’ve been back to that show in years and I’m really looking forward to it! I’ll be in Artists Alley (lower level) at Table H31. Fri., 2 p.m.: This is for everybody who wants to take their comic to the next step. We’re going to do a step-by-step tutorial covering the installing of a Content Management System (Comic Easel for Word Press). Your CMS is one of the most important aspects of your webcomic, and many of us avoid working on this because it seems so complicated. I’m gonna try to de-mystify it and show you how you can have a sleek, classy Web site operational in no time at all. Sat., 4 p.m.: This is actually two panels in one. For starters, you can sign up for a personal one-on-one consultation with me. We’ll go over your work, identify strengths and find ways to improve. It’s a private discussing, and I won’t be using any of the stuff we discussed in the public panel. But spaces are limited, so if you want to jump it, do it now. Then, at 4 p.m. on Saturday, I’m going to do a panel in which I run down ten things that you can do right now to improve your webcomic. We’ll be talking art, writing, site design, social media — the whole ball of wax. Having lead critiques at Webcomics.com since 2009, I see the same basic mistakes done repeatedly. We’re gonna go through ’em one-by-one and show you how to do it better. 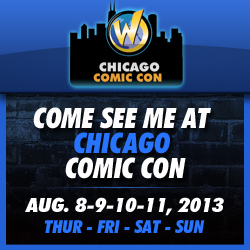 I will be on the road headed to Chicago for Saturday, so I will miss the webcomics 101 panel. Do you know if any one will be recording it? I can’t guarantee anything. If I record it though, I’ll definitely put it up on Webcomics.com.